The missions of California were Spanish settlements initiated by Spanish King Charles III and built between between 1769 and 1823. 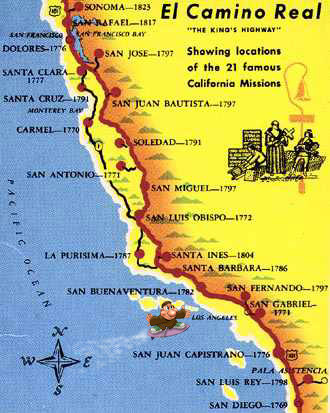 The chain of 21 primary missions along California’s El Camino Real (“The King’s Highway”) established a unified system of commerce for the whole area in advance of the founding of towns and cities. These farms, each located 1 day’s journey away from the next would ensure a contiguous trade route along the coast. Modern day U.S. Highway 101 follows the general route of the original trail. The Spanish had already claimed this land over 200 years earlier, but didn’t start settling it until they heard of plans by other powers to settle the area. The missions were a way of laying claim to the area. Life for the California Native Americans was forever changed. In addition to Christianity, the missions brought many other things to California such as livestock, fruits, flowers, grains and industry. Missionary activities thoroughly disrupted not only coastal tribes, but their demand for healthy laborers seriously impacted adjacent interior tribes. Massive herds on introduced stock animals and new seed crops soon crowded out aboriginal game animals and native plants. Epidemic diseases swept through the Mission Indian tribes resulting in thousands of deaths. In 1834, Mexico’s Secularization Laws were ratified, bringing the mission system to an effective end over a ten-year period. Using secularization, the mission lands were quickly moved through tribal possesion and then into private hands and the Indians effectively banished from them. Likewise, the buildings in the mission system were often routinely looted and the materials used for private construction. Without roofs and routine maintenance the adobe walls often just dissolved away in the rains. Through acts of Congress and court actions in the 1850’s and 1860’s the mission properties were largely returned to the Church. The Church was not always able to take on the burden of maintenance, however, so some missions continued their decline. Fortunately, over time, the importance of the missions was recognized by various restoration groups and the mission chain continues restoration activities to this day. Every one of the California missions tell a story about the history of California. All have been, to some extent, restored and can be visited today. Download free printable maps here and learn more about the history surrounding the California Mission system at MissionTour.org and the California Native American Heritage Commission websites.